In the Kundalini Awakening Part – 1, the ratio of Pooraka, Kumbhaka, and Rechaka was the basis of Kundalini awakening. In the current post of Kundalini Awakening Technique, the knowledge of Chakras and the feelings (Bhavana) of the practitioner are important. The first Chakra is Mooladhara Chakra, situated at the perineum in the males and at the cervix in females. Its symbol is a four-petalled deep red lotus. Spread a Yoga Mat and sit in any meditation posture, facing the East or North direction. Exhale completely and take the awareness to the Mooladhara chakra situated at the base of the spinal column. As you inhale, feel that the Kundalini Shakti, which is lying dormant in the Mooladhara Chakra is awakened and start moving up along the spine. It travels through Sushumna piercing one Chakra after the other chakra. Visualize the Mother Kundalini passing through Swadhisthana Chakra, then Manipura Chakra, Anahata Chakra, Vishudhhi Chakra, and Ajna Chakra to reach Sahasrara at the crown as the Pooraka is complete. Retain the breath for a short while. Chant the Pranava mantra ‘Aum’, or the mantra that has been given to you by Guru. Concentrate on Sahasrara, the Crown Chakra. Feel that by the grace of Mother Kundalini, the darkness of ignorance is being removed. Feel that your whole being is pervaded by light and wisdom. As you exhale, feel that the kundalini shakti is gradually descending from Sahasrara Chakra, then Ajna Chakra, Vishuddhi Chakra, Anahata Chakra, Manipura Chakra, Swadhistana Chakra and in the end reaches Mooladhara Chakra, from where it started its upward journey. Repeat the above process again. Continue the process as long as you are comfortable. There should be no strain. Make it a daily practice, fix the time of practice, place of practice and the period of practice. 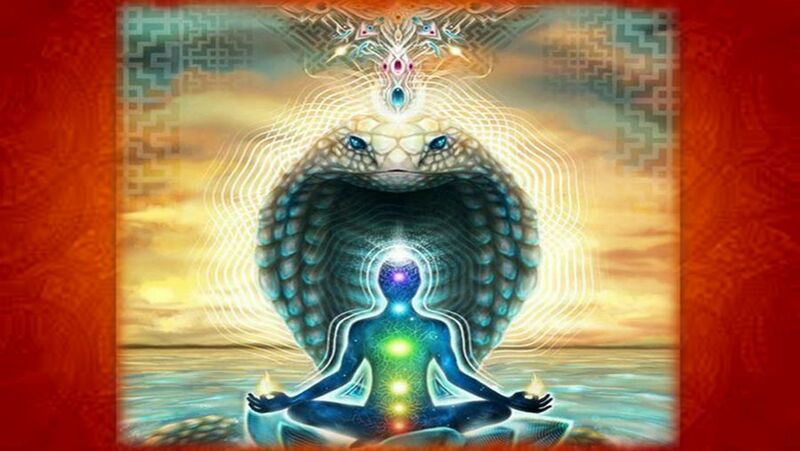 Awakening of kundalini does manifest positive and negative aspects. These aspects have a connection with the personality or the Samskaras of the person. The experience that one has, whether positive or negative is related to the intrinsic human personality, his Samskaras, and his karmas. If a man’s karmas are sattvic and divine, then his experiences will always be positive. If the karmas are not sattvic and full of confusion, psychological cobwebs, then his experience may be negative. The symptoms of Kundalini awakening include some sensations like a feeling of some electric current in the body or shaking of the body or a sensation of insects crawling on the body. One can experience some involuntary jerks, shaking, itching, etc. The feelings of heat or cold and spontaneous pranayama, asanas, mudras, and bandhas are other symptoms. The above stated Kundalini Awakening Technique is like a magic wand for attaining perfection very quickly. More clear and vivid the visualization of chakras will be, more rapid will the progress be in this sadhana. Also, more strong the feelings will be, faster the gains will be. Even a few days of practice will bring in a change good enough to convince you of its importance. The continued faith and the practice with full devotional attitude are bound to bring in the desired result. Kundalini yoga is an extremely powerful system of yoga and should be practiced under a Master (the Guru). The Sadhaka should first work for a few years on hatha yoga, kriya yoga, and pratyahara to prepare himself for the awakening of Kundalini Power.